Tyn Church (Týnský chrám), or The Church of Our Lady Before Tyn, dominates one side of the Old Town Square. 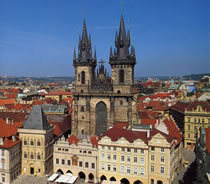 The twin towers of this powerful looking Gothic church (with a Baroque interior) can be seen from all over Prague. Although the origins of Tyn Church date back much further, the present high-Gothic structure was founded in 1385 as the main Old Town church. In the early 15th century, Tyn Church came under the control of the Hussites. But this was a tumultuous period in the Czech lands, when Hussites were being slaughtered by the ruling Roman Catholics. In the end, Catholic Jesuits took control, recasting the bell, and replacing the Hussites symbolic chalice with a large figure of Mary nailed between the towers. In 1679 a fire in the church lead to the interior being reworked in Baroque style, with the main aisle vaulted. The towers are around 80m high. But stand in the Old Town Square, and it becomes evident they are not symmetrical. One, Adam, is larger than the other, Eve. This representation of the masculine and feminine sides of the world is characteristic of Gothic architecture of the period. Legend has it that the Tyn Church towers gave Walt Disney the inspiration for the Sleeping Beauty Castle. True or not, the church is an awe-inspiring sight during the day, and even more so at night, brightly lit up against a night dark sky. The organ at Tyn Church dates from 1673 and is the oldest in Prague. Tyn Church has regular Roman Catholic church services. It also very occasionally hosts classical music concerts. For listings and to book tickets for classical concerts at Tyn Church: Prague concerts.